Are you looking for a simple, elegant, gourmet and versatile holiday appetizer? 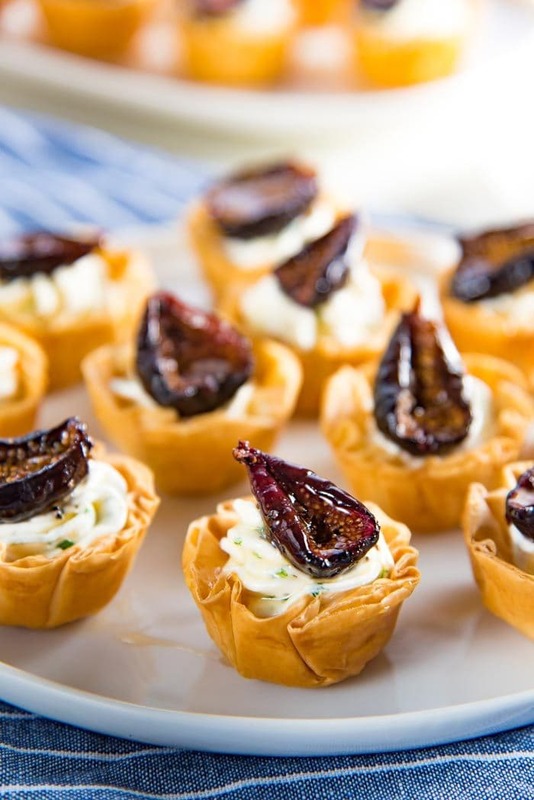 Then these Goat Cheese and Roasted Fig Tartlet appetizers are the perfect choice! Sweet, savory, creamy and crunchy all in one bite, these can be made a few days ahead of time, and the recipe is also very adaptable. 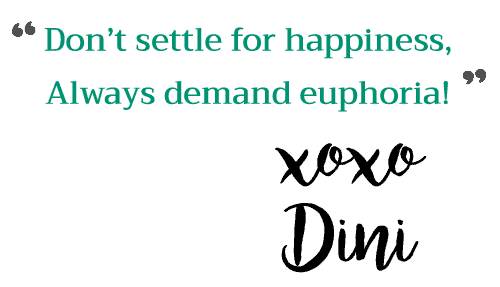 The best thing about the holiday season for me as a food blogger is that I get to start planning for the holidays much earlier than most others! 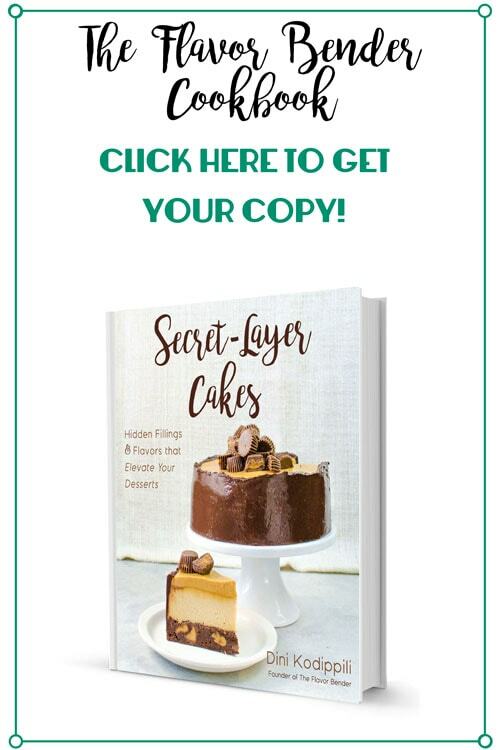 🙂 Researching for recipe ideas and concepts, and recipe developing and testing take quite a bit of planning, and it gives me the chance to soak up the holiday spirit for that much longer! Plus, it takes my mind away from the dreadful 24/7 news cycle these days. I can’t be the only one, right? 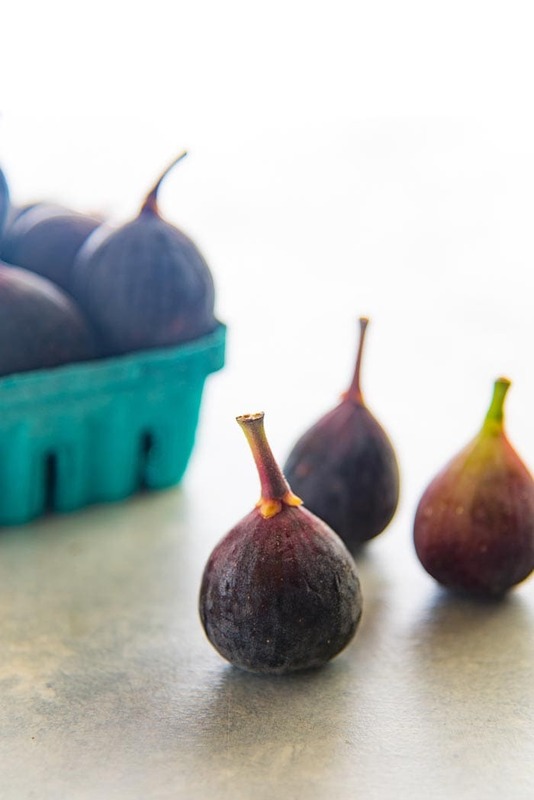 I wanted to make something really simple, yet elegant and gourmet with these figs. So I decided to roast the figs. 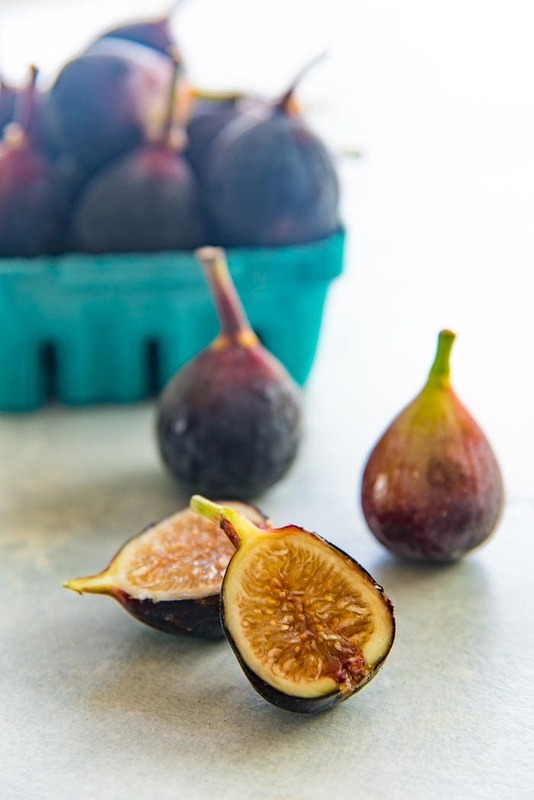 Roasting makes the figs even juicier and sweeter, and with added flavors, it really makes the figs pop! But, I didn’t stop there. Then I used the roasted figs to make these gorgeous fig tartlet appetizers that are PERFECT for entertaining this holiday season. I filled little phyllo cups with a herby goat cheese mix, and topped it with one half of a roasted fig and a drizzle of honey! 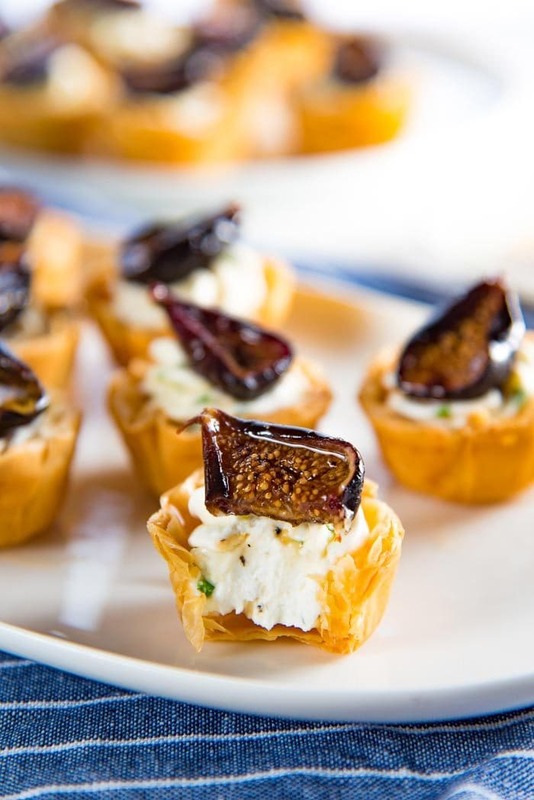 These Goat Cheese and Roasted Fig Tartlet appetizers are tangy, sweet, savory, fruity, crunchy and creamy, all in ONE BITE. They truly are an elegant appetizer choice to serve at your party, and they really couldn’t be any simpler. 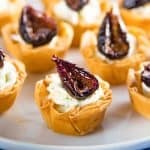 You can buy pre-made phyllo cups from the supermarket, so that these Goat Cheese Phyllo Cup Appetizers are even simpler to make. What if I can’t get pre-made phyllo cups? You can make your own in the oven with phyllo sheets – this is what I did here. It’s just a tad time consuming, but it’s pretty easy. Or substitute with mini shortcrust pastry cups. Or you can use mini puff pastry cups. Or gluten free cracker options to make this appetizer allergy friendly as well. What if you don’t like goat cheese? Or you want a vegan option? If goat cheese isn’t your jam, no worries. You can use cream cheese instead. 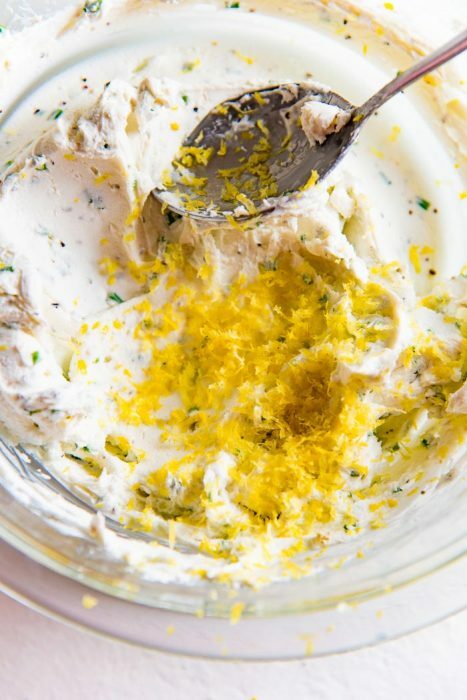 And use a cream cheese alternative for a vegan option, but remember to add some lemon juice to make it more tart. This roasted fig tartlet is super versatile as well. The roasted figs are the star, and everything else works to complement them. So you can adapt these goat cheese phyllo cup appetizers to your liking, or dietary preferences. You can substitute the honey with maple syrup or brown sugar too. I used Mission figs for this recipe. Since we are roasting them here for this roasted fig tartlet, you can use softer figs too, which will be sweeter as well. And roasting will only make them sweeter still. And if the figs you buy are firmer, no worries. The honey drizzled on top will sweeten them, and the flavor will intensify further after being roasted. I cut the figs in half, so that each fig tartlet gets a generous slice of fig on top. If you’re using particularly big figs, then you cut them into quarters too. But make sure to have a delicious mouthful of fig on these babies. You can make each part of this fig tartlet appetizer ahead of time. The phyllo cups can be made ahead, and stored in an air-tight container (if you’re making them yourself). 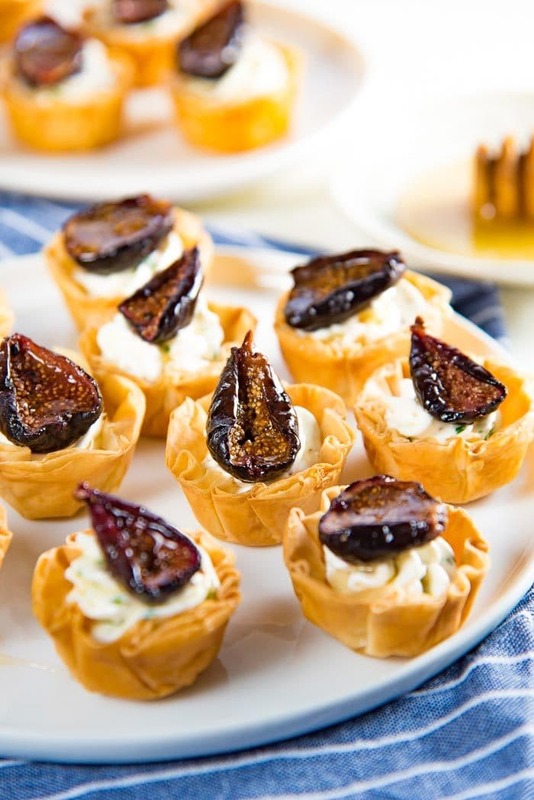 OR if you’re buying them, you can reheat the cups just before you assemble these fig tartlet appetizers. You can make the whipped goat cheese filling ahead of time and store it in the fridge for up to 3 days. I like to keep it in an air-tight container, or scoop up all of the filling into an UNCUT plastic pastry bag and secure it tightly with a rubber band, IF I make it the DAY BEFORE. Then on the day, I just snip the end of the pastry bag and pipe it into the phyllo cups. The figs can be roasted up to 5 days ahead. Just make sure to cool them down first, then keep them in an air-tight container, or a Ziploc bag. 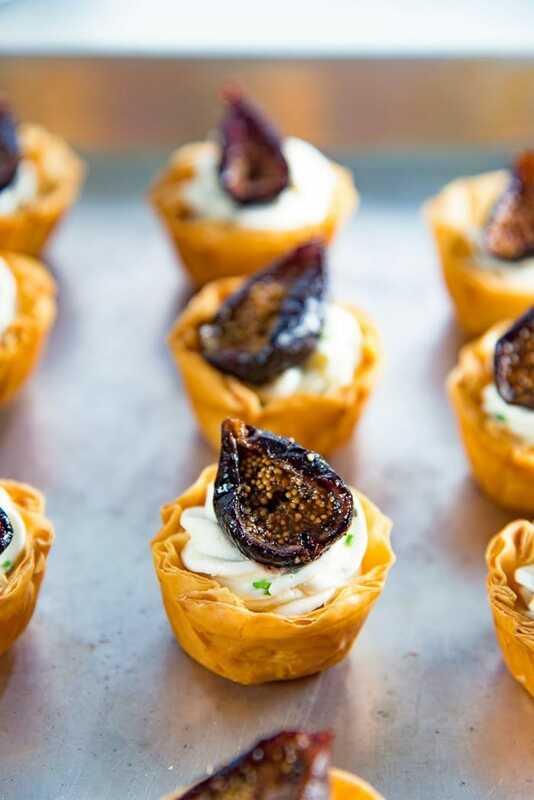 Then on the day that you’re serving these roasted fig tartlet appetizers, all you have to do is pipe the goat cheese filling into the phyllo cups and top them up with figs and an extra drizzle of honey. 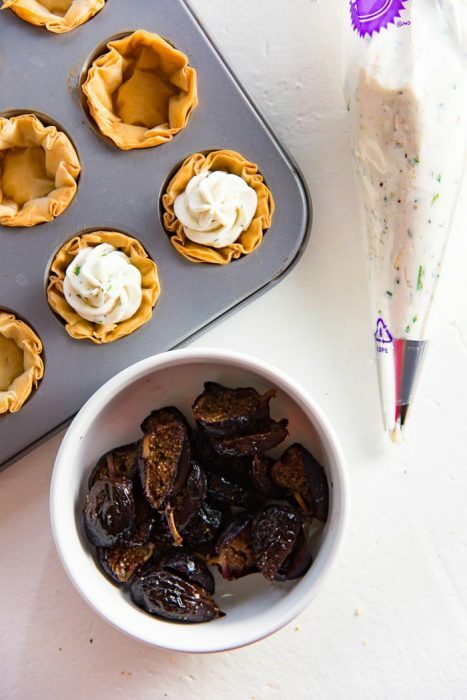 If you liked this goat cheese and roasted fig tartlet recipe, don’t forget to subscribe for new (and free) recipes by entering your email address on the side bar (and get all these recipes delivered straight to your inbox), so you don’t miss out on a thing. You can find me on FACEBOOK, TWITTER, INSTAGRAM, PINTEREST, YOU TUBE and GOOGLE-PLUS too. 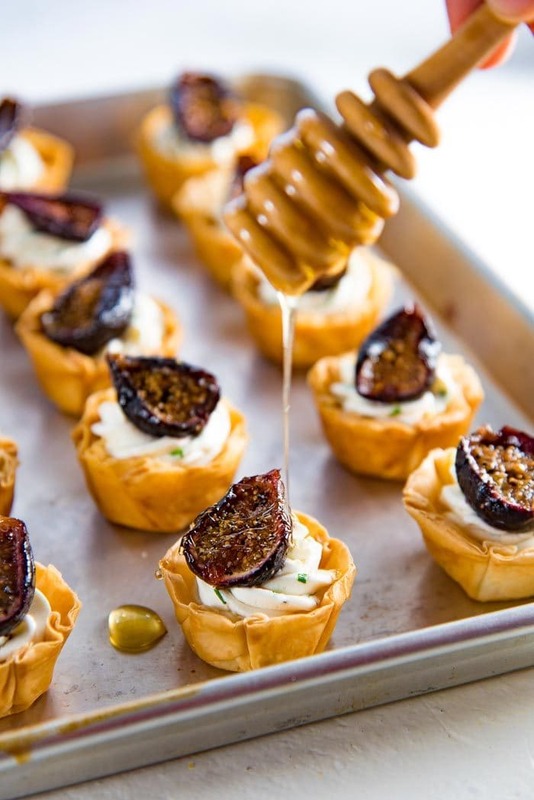 Goat Cheese and Roasted Fig Tartlet - Sweet, savory, creamy and crunchy all in one bite. These appetizers can be made a few days ahead of time, and the recipe is also very adaptable. Cut off the stem of each fig, and then cut each fig in half, lengthwise. Place the figs on the parchment paper. 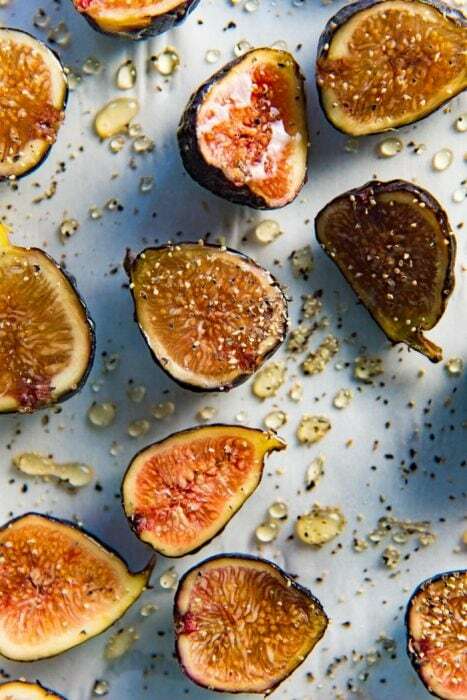 Drizzle the figs with honey, and sherry, and sprinkle with the black pepper. Toss gently to combine. 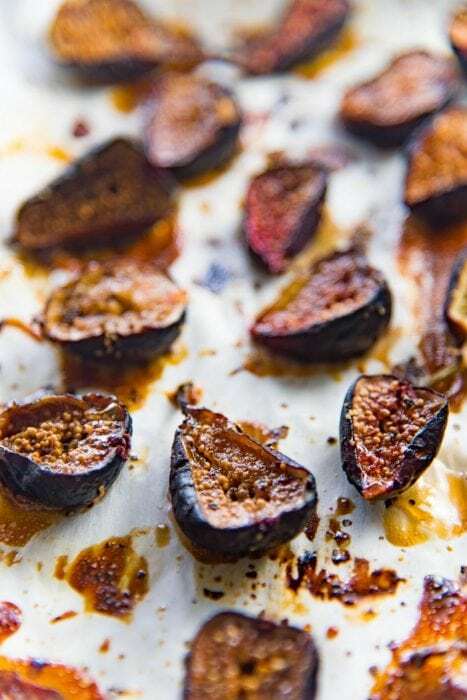 Place the figs in the oven and roast for 20 - 30 minutes, until the figs start to caramelize on the surface. Remove from the oven and let them cool. Use immediately OR store in an air-tight container in the the fridge for up to 5 days. Place all the ingredients in a bowl and use a spoon to mix everything together. Adjust the amount of cream you add depending on the consistency that you prefer. 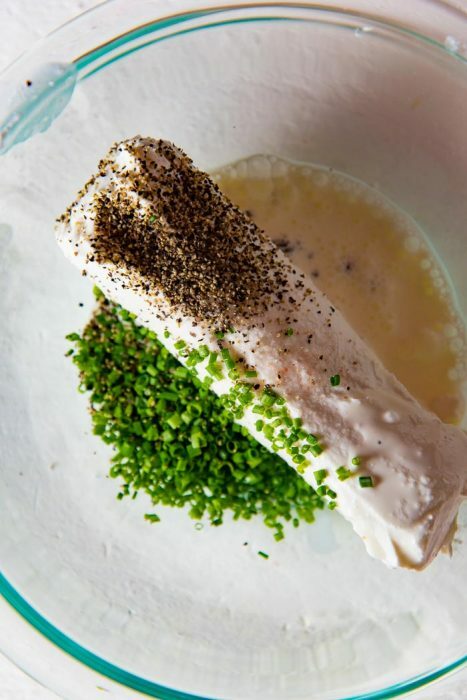 The cheese filling should be creamy and pipeable. Place the goat cheese in an uncut piping bag, or an air-tight container and store in the fridge for up to 2 days. Assembling the Tartlets (best assembled just before serving, but can be kept for up to an hour without getting soggy). 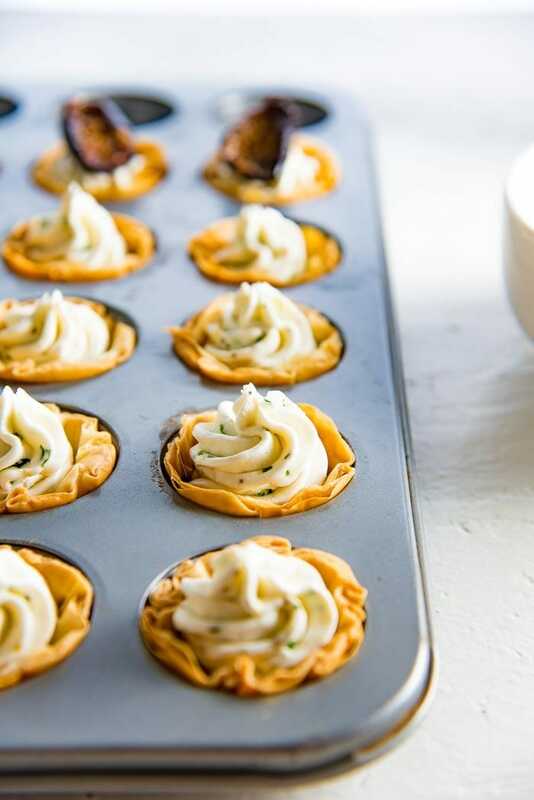 Place the mini phyllo cups on a tray. Snip off the edge of the goat cheese filled piping bag. You can attach an open star tip if you like, but a round opening is perfectly fine too. Pipe the goat cheese filling into each of the phyllo cups. Top with one half of a roasted fig. Drizzle with honey before serving.